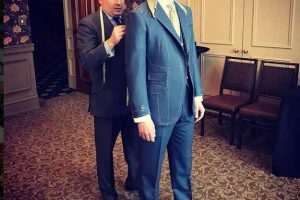 Choosing a bespoke tailor to suit yourself is not as easy as it might seem. 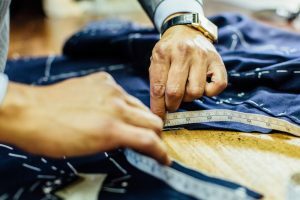 If you have not been recommended a tailor it can be tricky to find the right one for you, the best tailors have different house styles. My coat style prefers a softer draped chest, soft natural shoulder and higher cut arm holes. Which, I learnt from my father John Hitchcock at Anderson and Sheppard. When you commission a suit from me you can be sure that I will cut your pattern out myself. I will cut your suit from your chosen cloth and will fit your suit. Most tailoring houses do not have such a personal service. This is because the larger tailoring houses are not owned by classically trained tailors, but by savvy business investors. The fact that I am the owner, cutter and tailor is a pure form of tailoring.I control every aspect of my bespoke business. My suits are hand crafted by the very highest skilled personally hand picked tailors found in Savile Row. I work closely with my coat makers to ensure they produce exactly what I set out to achieve.I truly believe that I am one of an exclusive group of ‘thoroughbred’ Savile Row Tailors who are left still making genuine traditional bespoke suits in the old school way. It is very rare to find a proprietor who has been through their apprenticeship as I have, with knowing both how to make and to cut, which gives me a great advantage over other tailoring houses.I do feel in the next few years Savile Row will change a great deal, with many Master Tailors retiring and new so called ‘Master Tailors’ opening or just travelling to the Row to gain the kudos, selling made to measure suits produced in factories overseas with no training or feeling for craft or tradition just to make money. 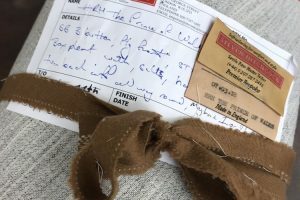 These fictitious tailors do not have any formal training in cutting or sewing which is in my view denotes the very essence of British hand crafted bespoke tailoring.My tailoring business is relatively small, which I prefer. I will only make a limited amount of suits each year and do not wish to make any more. At the current pace this keeps me extremely busy, any more and the quality may start to suffer. 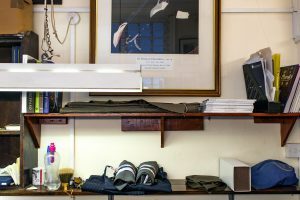 As with my existing clients, I look forward to building lasting relationships with new ones.I have be in the trade for nearly 30 years now, starting straight from school at the age of 16 and I have now run my own tailoring firm since 1999. 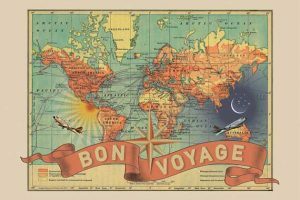 It’s hard for me to believe, as the time has gone by so quickly! I feel lucky to continue to make my living in the trade that I enjoy so much. 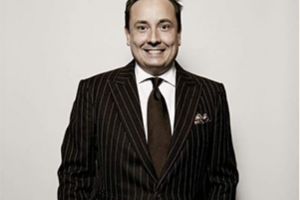 I have been fortuitous to meet and make suits for some great people including Vernon Kay, Patrick Head, Jason Atherton, The Al Thani family and it was a great honour to make in 2001 for H.R.H. The Prince of Wales. I look forward to seeing what another 30 years brings! Behind the scenes of the craftsmanship of Soft Tailoring. 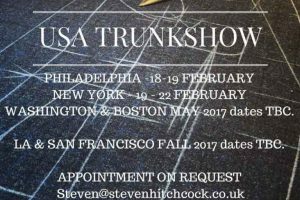 USA Steven Hitchcock bespoke trunk show.